It was a little tricky having STAN LEE WEEK run across the Christmas holidays, but I wanted to make sure I would be able to crossover with his birthday (which was yesterday's post). There was so much going on during Christmas week, and even this week leading up to the New Year's Day. Often that's a time I use to catch up on end-of-the-year tasks, and also a time when I catch up with certain friends and acquaintances. So I wasn't able to cover all the topics I wanted to, or stay on a tighter schedule for posting, but, I guess we can all come back here next time for SON OF STAN LEE WEEK! But I have one last post today to wrap up this series. I'd like to share with you some of my favorite Stan Lee-written comics. After all, his role of writer and co-creator of some of my favorite heroes and comics books is really the core of his legacy, in my opinion. 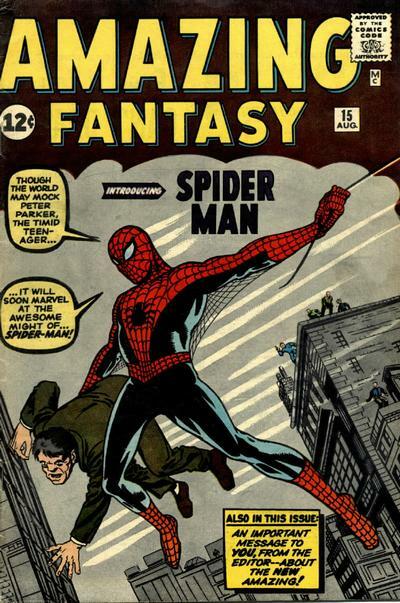 AMAZING FANTASY #15, the first appearance and origin of Spider-Man. By far my favorite superhero, and this is actually my favorite single comic book of all time. AMAZING FANTASY featured several short stories, dealing with sci-fi or mystery/horror stories, ending in Twilight Zone-type twist endings. 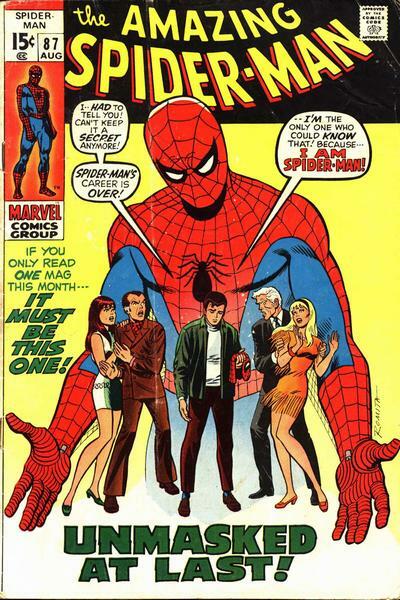 Well, for the final issue, #15, published in June 1962 , Stan Lee and Steve Ditko created a new, off-beat brand of superhero: a teenager with zero popularity amongst his friends, given superpowers by a radioactive spider. A stupid, arrogant act on Peter Parker's part leads to the death of his beloved Uncle Ben, and henceforth decides to use his newfound powers to fight crime. What a hang-up! 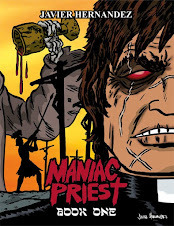 Immediately appealed to my young Catholic guilt when I read it for the first time (as a reprint in the mid-70s)! The peculiar art, fascinating costume and atmospheric nature of the storytelling by Steve Ditko had the strongest appeal on me. Stan's deftly clever and melodramatic scripting was the perfect icing on the cake. 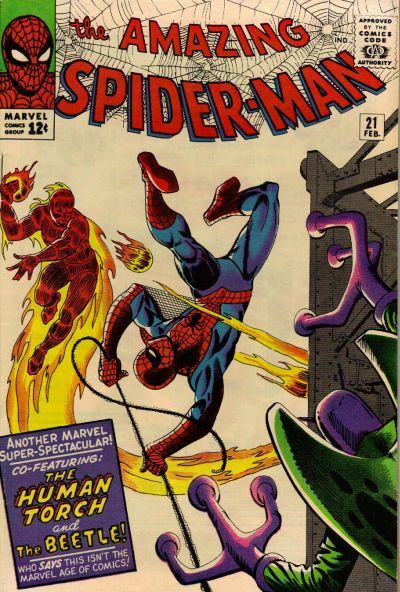 Stan and Steve produced 38 issues together of THE AMAZING SPIDER-MAN, (plus two Annuals) and ranks as my all-time favorite run of superhero comics. 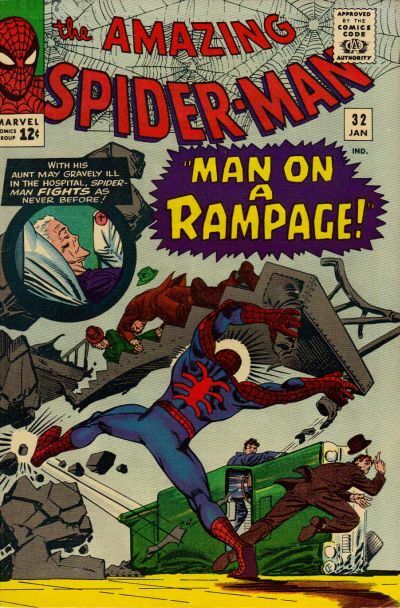 The early soap opera life of Peter Parker was a tumultous tornado of emotional turmoil: Constantly caring for his Aunt May, who was terrified of Spider-Man (whom he actually made a widow by not acting to save his Uncle when he could have), not being able to commit to Betty Brant because of the specter of Spider-Man coming between them, his destructive relationship with his boss, and Spider-Man's constant foe, publisher J. Jonah Jameson, and on and on. Stan was relentless in getting the maximum emotional angst out of all the situations Peter Parker found himself in. 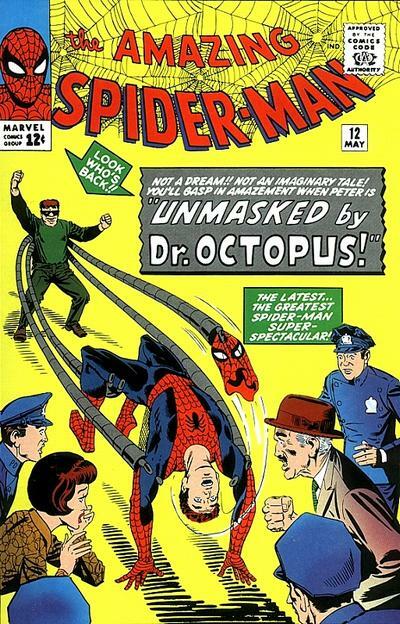 And Ditko's artistry and storytelling made me a life-long fan of his work, even after he had left Marvel. So much of what I love about good old-fashioned American superhero comics is found in the 1000 or so pages of Spider-Man by Stan Lee and Steve Ditko. My other favorite Stan Lee written superhero comic book series has to be the first 100 issues he created with artist Jack Kirby. 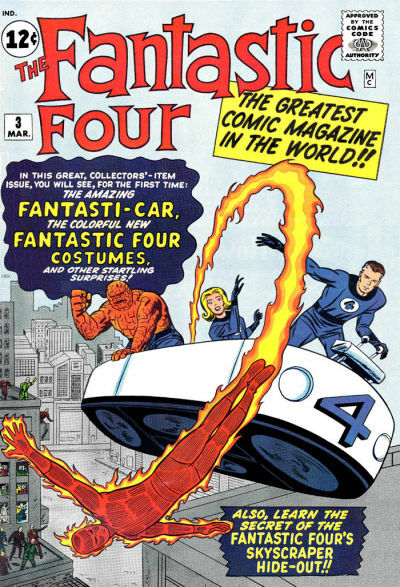 Debuting in 1961, THE FANTASTIC FOUR was to be Marvel's answer to the then popular JUSTICE LEAGUE published by DC Comics. 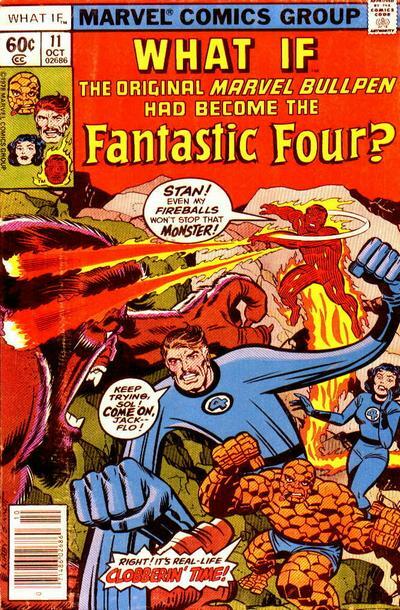 Right from the beginning, the Fantastic Four were different. They had no secret identities they kept from the public, and didn't even get costumes until the 3rd issue! They were also banded together as a family, not just a group of people joining together to form a team. Reed Richards and his girlfriend (later wife) Susan Storm were joined by her younger brother Johnny Storm and Reed's friend Ben Grimm on a private flight to space. Bombarded by cosmic rays, they returned to earth with fantastic superpowers, which they soon used in a lifetime of adventures thwarting giant monsters and evil masterminds. 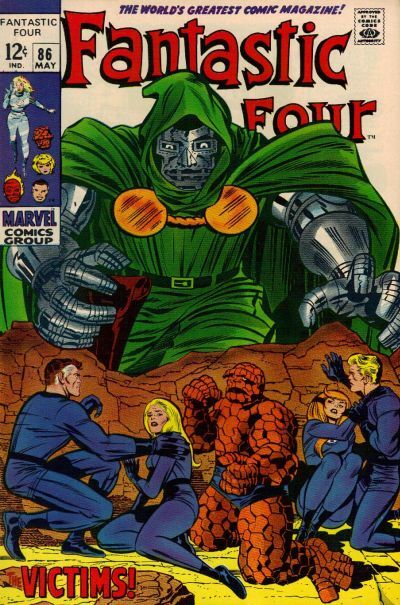 What was so gripping to me about the Fantastic Four was their very nature as a family. And being a family meant they could actually fight amongst themselves, even as they're trying to go about their duties as superheroes! Ben Grimm, now The Thing, would sometimes go off his rocker with anger at being turned into a monster. Or he and Johhny Storm, the Human Torch, would try to one-up each other with wicked pranks, never mind that the Torch was a teenager and Ben was pushing 40! Again, Stan's whirlwind writing had to give each member a distinct personality as well as move the story along with a mix of science fiction, adventure and family melodrama. 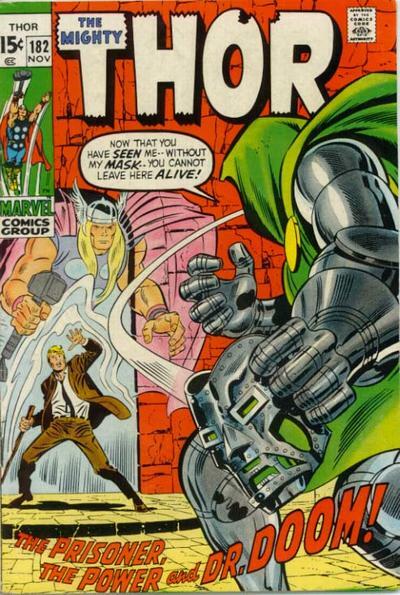 The other half of the creative team was of course Jack Kirby, by far the most imaginative, dynamic and inventive storyteller and creative dynamo Stan has ever worked with, in my opinion. 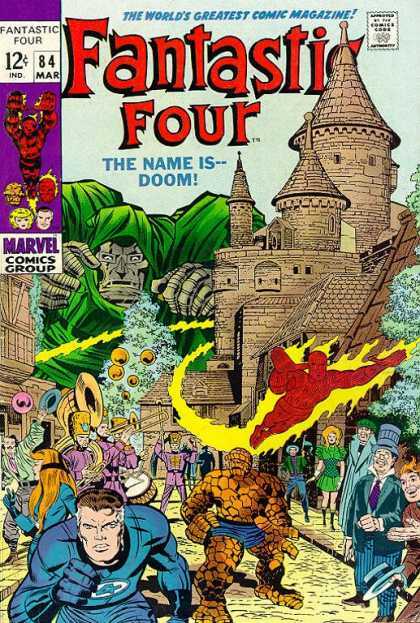 In Kirby, Stan found a creator who pushed the boundries every time with new imaginative ideas, a plethora of amazing villians & guest stars, and enough explosive drama in his penciled drawings to inspire a round table of writers. 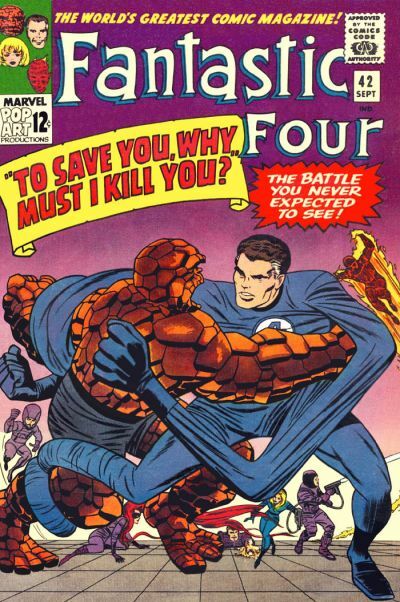 For me, the entire 100 issue run of FANTASTIC FOUR by Lee and Kirby is the pinnacle of 1960s Marvel Comics dynamic superhero action. 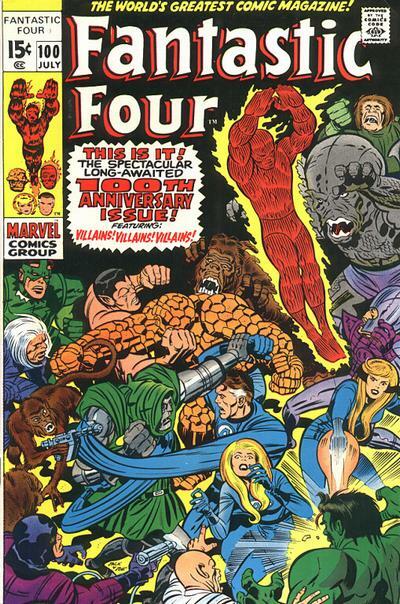 Kirby left after issue 101, and Lee stopped writing the book at issue 114, but what a great run they had. 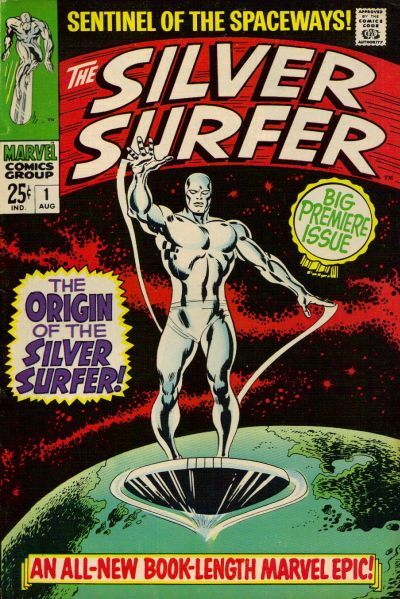 Another one of my favorite runs of Stan Lee's writing is THE SILVER SURFER, the 18 issue series done in collaboration with artist John Buscema. Originally created by Jack Kirby and Stan Lee a few years previously in the pages of the FANTASTIC FOUR, the Silver Surfer was given his own title in 1968. Granted cosmic powers from the Fantastic Four's supreme adversary Galactus, under Stan's hand, the Surfer was often portrayed as a sort of extraterrestrial philosopher, commenting on the inhumanity he often saw displayed upon the planet he was exiled to, Earth. With the expressive, classical and lush artwork of John Buscema, Stan was able to really expand on the Surfer's role as an almost Christ-like figure of piety and innocence. 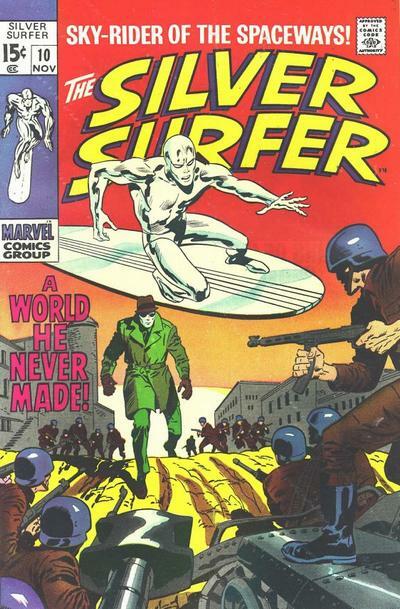 The Surfer would often find himself attacked for no reason other than being a stranger, or he might get befriended by someone only to have them turn on him once their trap was set. And always, the Silver Surfer would travel our world and lament the bigotry, the wars, the crime, the inhuman suffering he would witness. supervillians. While just as melodramatic as his earlier comic book writing, the Surfer really gave Stan a platform to write more poetic, flowery dialogue, speaking to concerns the author and a good percentage of his readership shared. 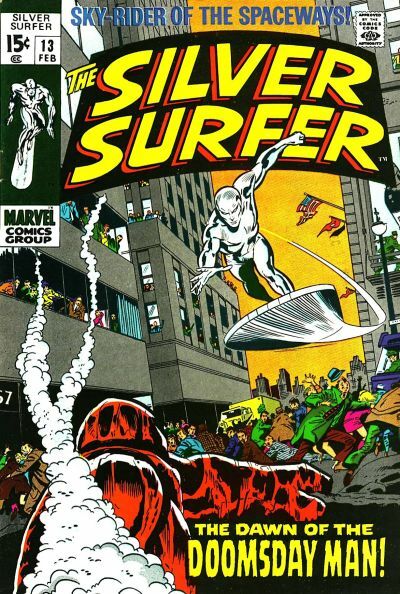 The Surfers quasi-Biblical metaphors, his Zen-like reflections, his commentary on man's cruelty to his fellow man did something to raise the content on a superhero title. These are only a few of my favorite Stan Lee comics, but they're definitely the top of my list. I can surely fill a lot more blog posts reminiscing about more comics, but we'll close off the STAN LEE WEEK with this entry. Thanks for reading along, and thanks to those of you who've been commenting to me hear or elsewhere how much you've enjoyed these posts about Stan Lee, and how much his work has affected me as a reader and creator. 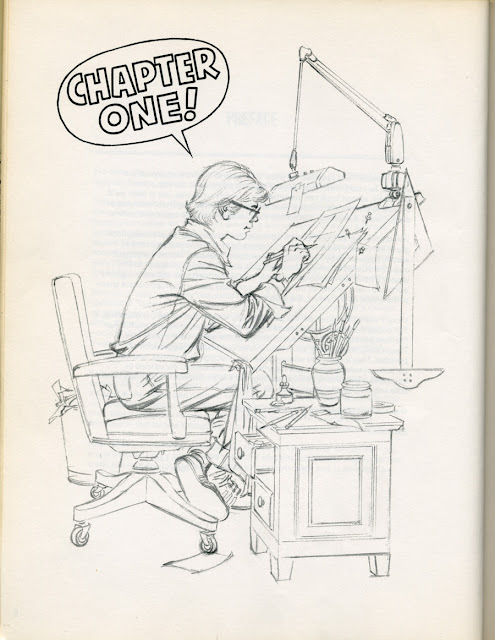 STAN LEE WEEK: How I learned to draw comics... my way! After a brief interuption for the Christmas holiday, I'm back with a new entry for STAN LEE WEEK! 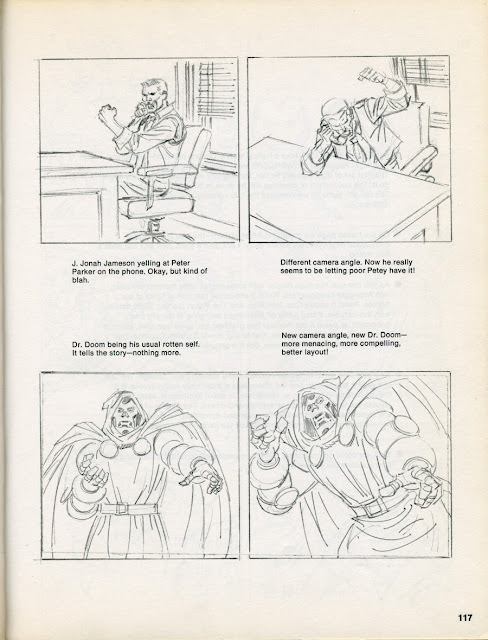 In my previous post, I provided a link to a Youtube video showing a clip to Stan Lee and John Buscema from the "HOW TO DRAW COMICS THE MARVEL WAY" video. Based, of course, on their best-selling book of the same name. My actual copy of the book, some 30 years old and well-read. I must have been around 13 or 14 when I first got this at the local bookstore, BOOKLAND. What a thrill it was to get this, after reading about it in STAN'S SOAPBOX (published in the Bullpen Bulletins every month in Marvel Comics). Here was the book that showed the techniques and steps an actual Marvel artist took to create a comic book. 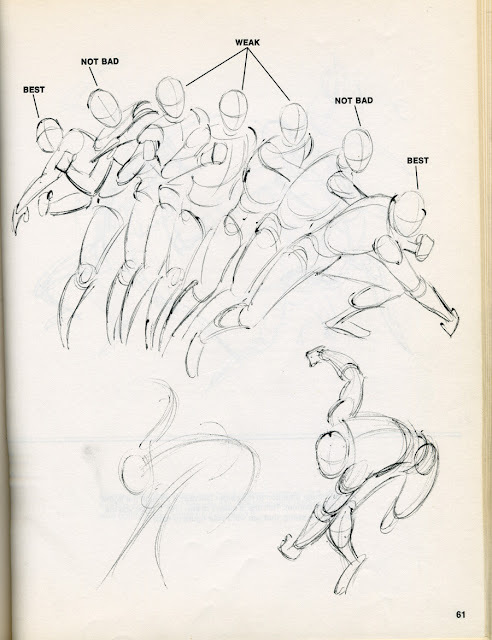 John Buscema, one of Marvel's top pencillers (SILVER SURFER, CONAN THE BARBARIAN, THE AVENGERS), had been teaching a comic book art class in NY, and it was decided that he should design and illustrate an instructional book showing his process. Stan took the writing chores, and giving it the hyper Marvel spin, added a friendly, conversational tone to the project. This image, early on in the book, really captured my attention, and made me fantasize what it would be like to become a comic book artist, sitting at my very own drafting table creating my own comics. The artist in the drawing didn't look that much older than me, making the possibility even more tangible. The book lots of the basic lessons you see in most books of this kind, demonstrating how to look at the human figure as individual shapes, and how to construct your drawings using stick figures which you late flesh out. Because this book was to show you how to draw like a Marvel artist, though, emphasis was placed on choosing the more dynamic pose available. Not stiff and pedestrian like Marvel's competitors! 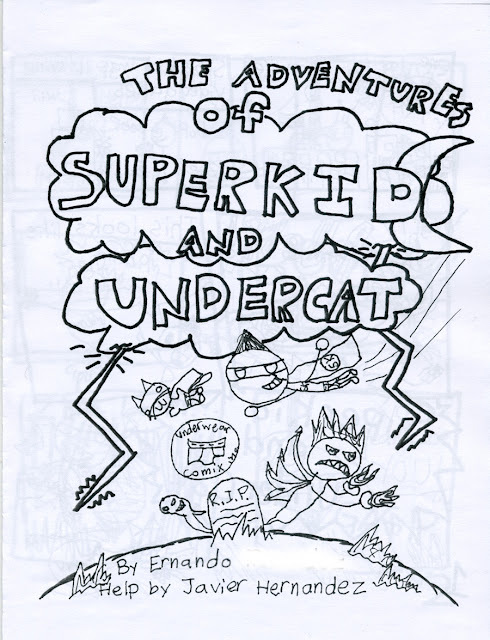 I certainly wasn't even thinking of becoming a self-published cartoonist at that early age (if I even thought that that was even a possibility), but I wasn't necessarily wanting to become an artist working for Marvel either. I just loved seeing how the comics were created and hoped to one day do the same. As in the sample below, Stan's commentary planted in my head that the artwork should always attempt to really showcase the action and emotional intent of the scene, before the dialogue is even written in the word balloons. The chapter where they finally showed you how to create an actual comic page was probably the highlight for me back then. It was interesting to the how figures were constructed, and how perspective and panel composition are created, but to see all the elements come into play for an actual page, well, that was the whole gist of what I wanted to see. Around the same time, 1980 or so, I most likely had read or seen other cartooning books on how to draw characters and faces. But this was my first time really seeing how an actual comic page was done. Stan's commentary clearly explained what John was demonstrating, and with his relaxed conversational style, Stan made the lessons much more approachable, instead of feeling like a dry textbook. I think that, as a kid, knowing the comic book characters probably also added to the interest in the book, making the material all that more familiar. 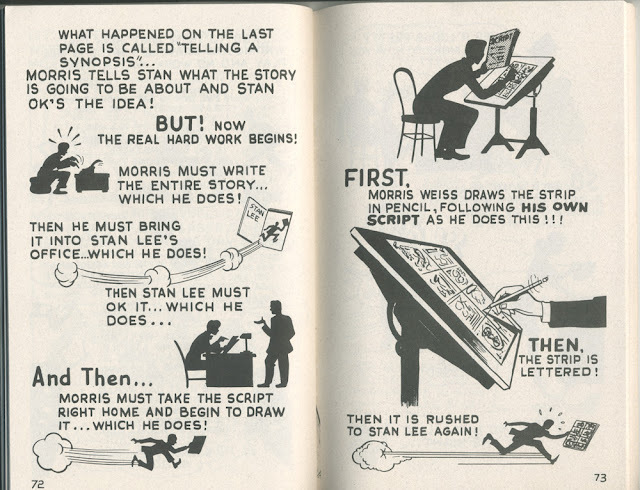 As I mentioned, Stan would often emphasize how many of the approaches in the book were the way which Marvel artists worked, creating more dynamic artwork and storytelling than the 'average comic book company'. But even without that layer of hype, the book was an extremely important tool in my development of a comic creator years later. 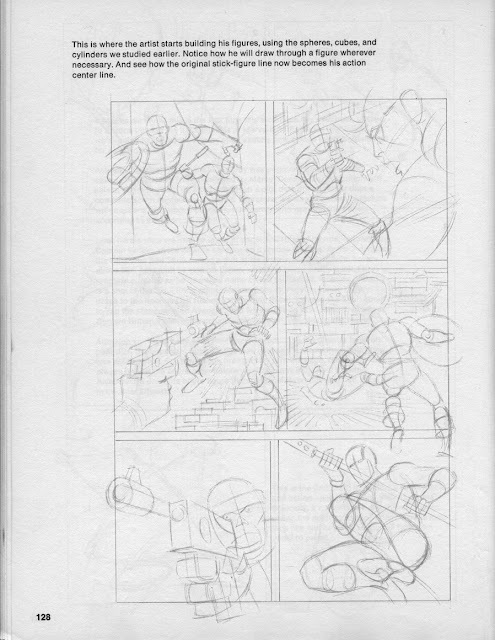 While there were many other influences that developed my style of art, and personal aesthetic, HOW TO DRAW COMICS THE MARVEL WAY was an early and powerful influence. 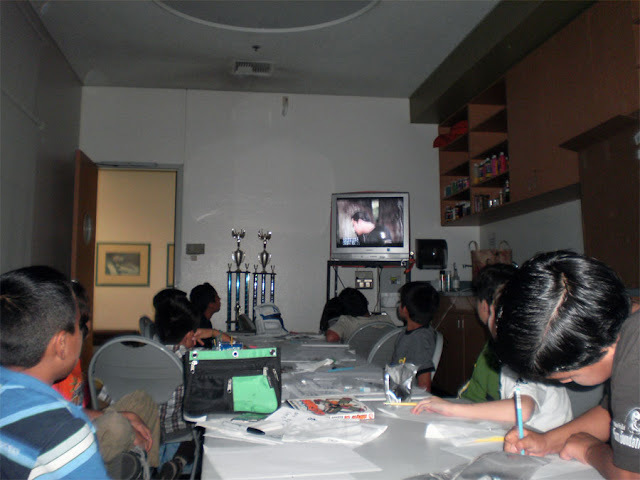 I recently taught a 5 week comic book workshop to a group of young kids. I don't use this book in class as a guidebook, but the fundamentals found in it's pages are still a part of the lesson plans I use. I think one of the things I always try to stress to my students is to vary their 'camera angles' in their panels, so as to not always get those static shots that an 'average comic book art student' would do! 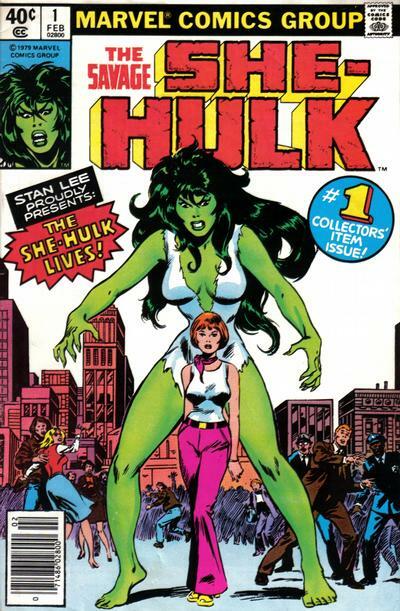 The actual comics themselves are of course the first and primal inspiration, but books like this and ORIGINS OF MARVEL COMICS took away the fourth wall and gave me a direct access, through Stan Lee, of the secrets behind the comics. In 1947, Stan Lee wrote this 99 page booklet, with illustrations by Ken Bald. 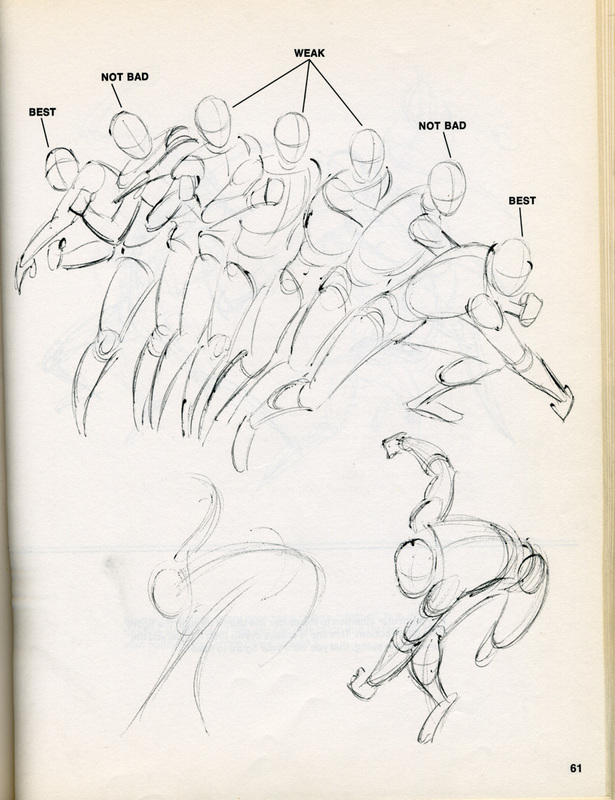 It's one of the very first 'how to draw comics' instructional books ever made. A few years ago I bought my copy on Ebay. This was a reprint from sometime in the 1970s. At least, that's what the listing stated. I very much doubt I got an original 1947 edition. But if I did, I got a great price and it's in miraculous condition! Tomorrow on STAN LEE WEEK, we'll take some time to celebrate Stan's 88th birthday! See you then, heroes! STAN LEE WEEK: Stan Lee video "How to Draw Comics the Marvel Way"
With Christmas Eve and Christmas Day upon us, I haven't had too much time to make a longer post, but I think this video clip will actually be a good lead in to my next post for STAN LEE WEEK. 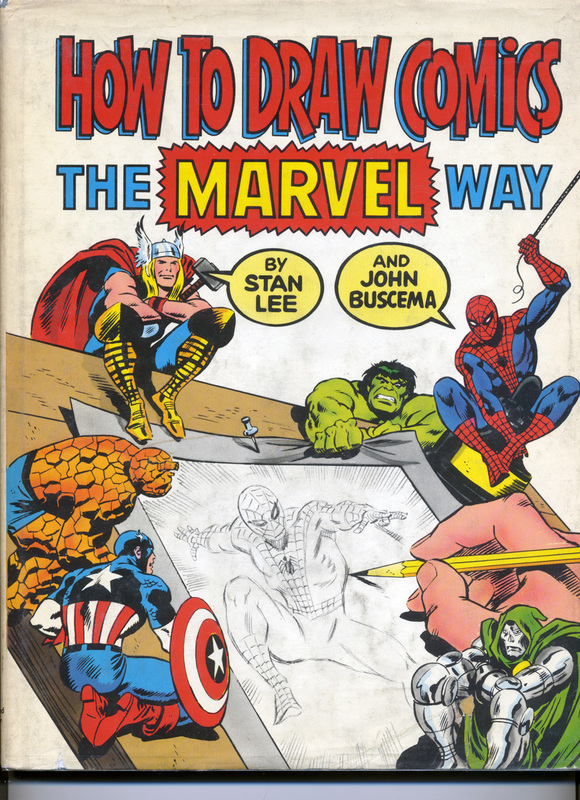 "HOW TO DRAW COMICS THE MARVEL WAY" was a big deal to many Marvel fans, and young artists. 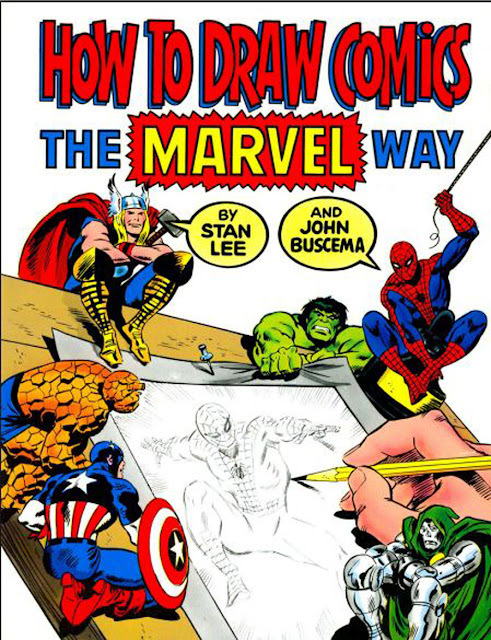 A book by Stan Lee and Marvel Comics artist John Buscema on how to draw comics like the ones published by Marvel?! I got my copy around 1980 or so, and this opened my eyes to how the comics I loved to read were actually created. 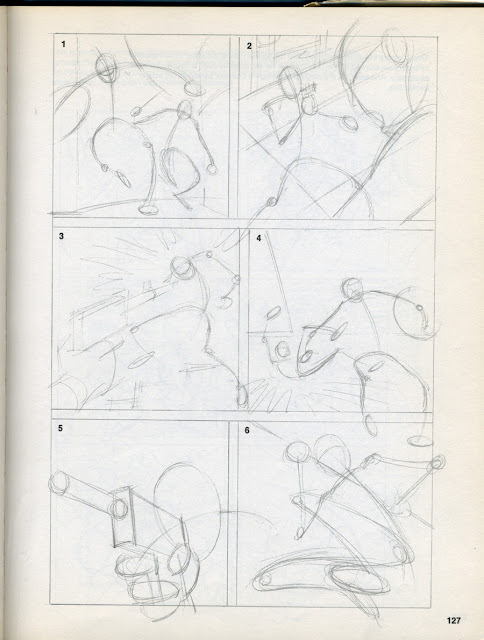 Like the book I reviewed in my previous post, "ORIGINS OF MARVEL COMICS", this drawing book was another principal factor in really setting me on the path to inspiring me to make my own comics. In the late 1980s, Stan and John actually performed a reading of the material for a videotape (remember those?!) version of their landmark book. Here's a link to Pt. 1 of the series via YouTube. (The embedding feature has been turned off, sorry). Take a look at it, and in my next post I'll go into more depth on the actual book, and how it appealed to me as a kid. Thanks to the folks who've been letting me know how much they've been enjoying this series of Stan Lee related posts. I'm glad the material has been appealing. And for anyone who actually gave a copy of "HOW TO DRAW COMICS THE MARVEL WAY" book for somebody's Christmas gift, you've just earned a No-Prize! Have a great Christmas, and see you back here for more Stan Lee Week! 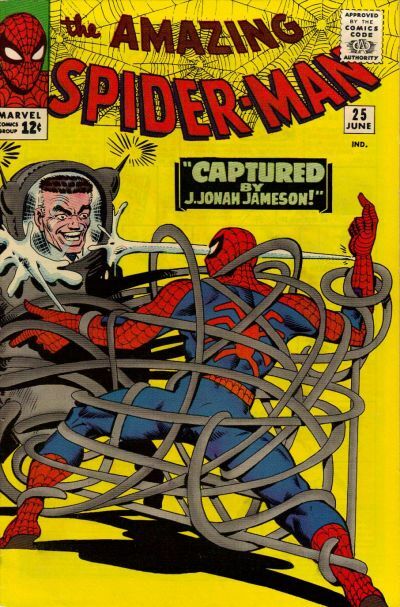 This is my second post in my week-long look back at legendary Marvel Comics writer/editor/publisher Stan Lee, and the influence he's had on my own work. 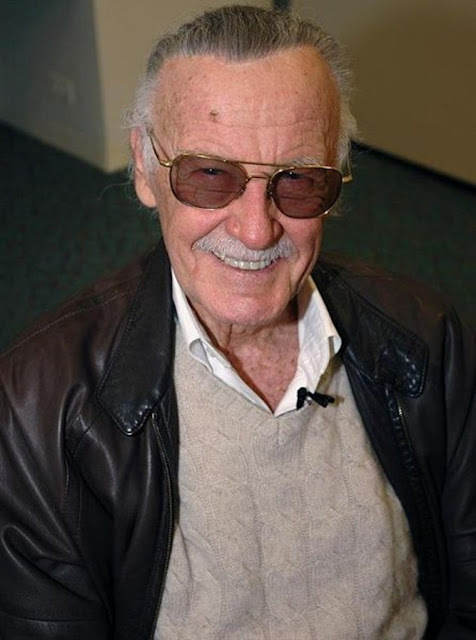 For my first post of STAN LEE WEEK, click here. 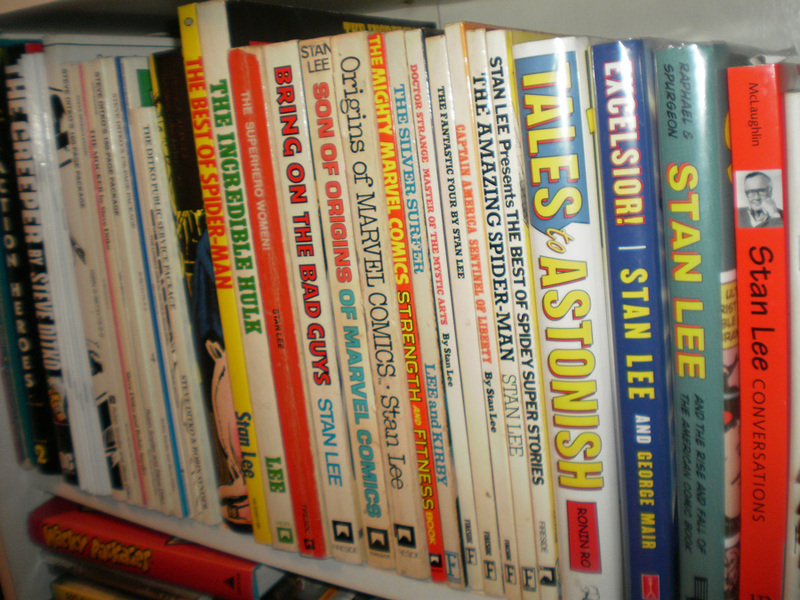 On one of my bookshelves, I have a collection of books featuring biographies and collections of work by Stan Lee. (Next to a collection of Steve Ditko comics and compilations. More on him later!). Two of those books have had an everlasting impact on me, both as a young fan and more importantly I feel, on the way I would eventually create my own comics. Back in the middle 1970s, I was already buying my own Marvel Comics at my local 7-11, as well as on trips to the markets with mom. I also started shopping at a local bookstore called BOOKLAND, located on Greenleaf Ave in the heart of Uptown Whittier. What I loved about Bookland was not just that they carried a complete selection of all the newest comics, but behind the front counter (I always assumed it was for the most prestigious books!) they carried the recently-published paperback books from Simon & Schuster written by Stan Lee. And the one my eager eyeballs zeroed in on was ORIGINS OF MARVEL COMICS! 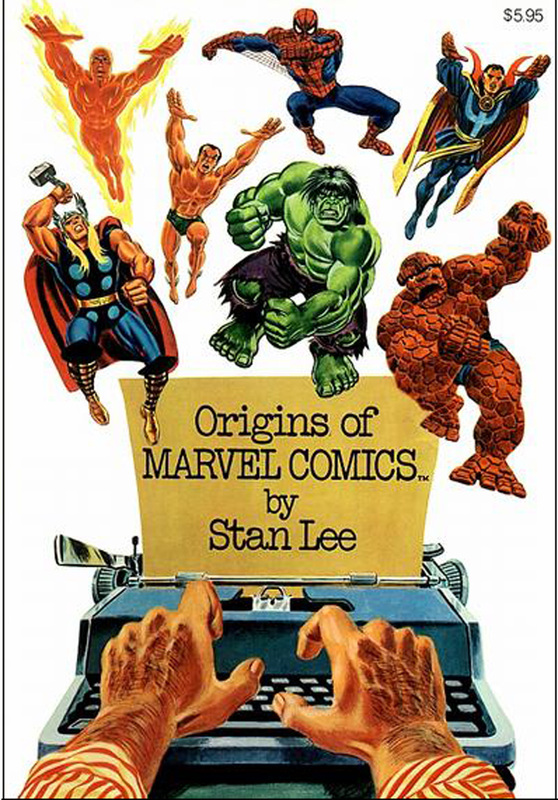 ORIGINS, which I had read about in Lee's STAN'S SOAPBOX (more on that later) as well as seen numerous times in various ads throughout the comics I bought, was a collection of the first issues and origin tales of the initial wave of Marvel Superheroes. THE FANTASTIC FOUR, THE HULK, SPIDER-MAN, THOR and DR. STRANGE. 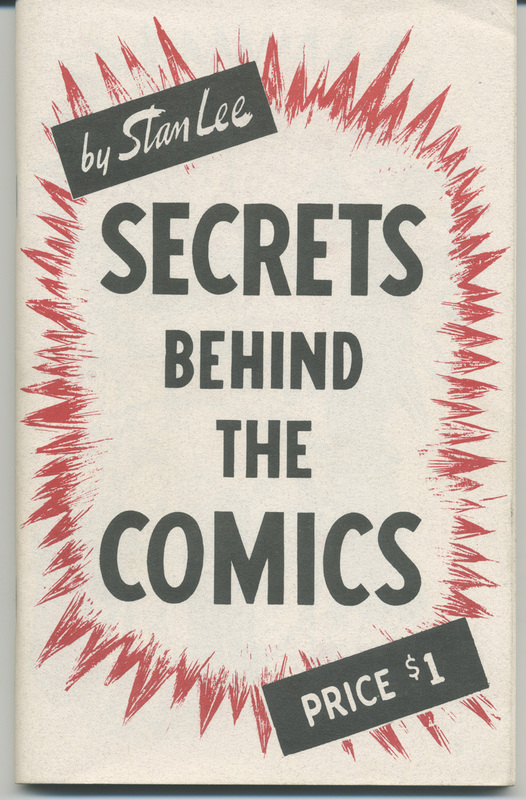 Not only were there first appearances reprinted, but Stan had written introductions to each title, presenting the reader with the 'behind-the-scenes' secrets on how the characters were created. 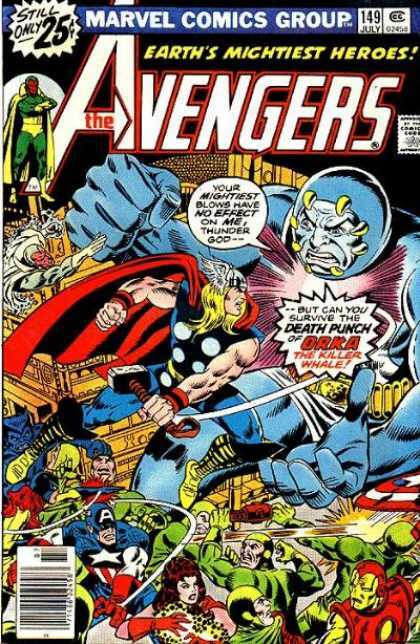 What struck me about his collaborations with artists Jack Kirby (Fantastic Four, Hulk and Thor) and Steve Ditko (Spider-man & Dr. Strange) was the "Marvel Method" Stan employed. After coming up with the initial idea for the book, he'd call in one of the artists and either discuss the plot or give them a few lines of what the story was about. The artist would then proceed to basically create the whole story in the form of the artwork, designing all the characters, their visual personalities, the pacing of the stories and environments they lived in. Staring at pages of wordless artwork, Stan would then have to create the dialogue from scratch, using the artwork as the map of the story. It's been shown that Kirby would include his own dialogue and narration, which Stan, as the credited writer and editor, chose to either follow or change to his own liking. As a young 'Marvelite' however, the ORIGINS book really opened my eyes to the very idea of creating characters. Forming a character based on a variety of influences and interests, and shaping those into an interesting character with unique traits and personalities. While it was the actual comics themselves that entertained me with their fascinating and far-out characters and artwork, Stan's explanations for the origins of the characters really planted the seeds in my mind about using my imagination to conjure up my own comic book characters. 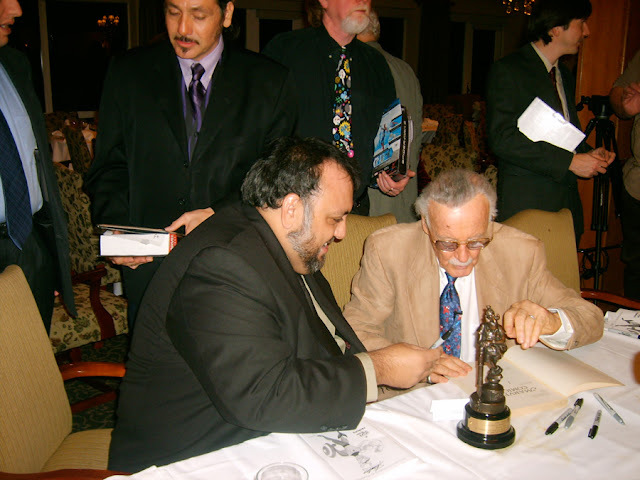 A few year ago, in 2007, I was invited by my good friend Michael Aushenker to the annual CAPS (Cartoon Art Professional Society) banquet, where they honor a guest from the comics/cartooning field. Stan was the guest for the year, and Michael knew I'd want to be there. 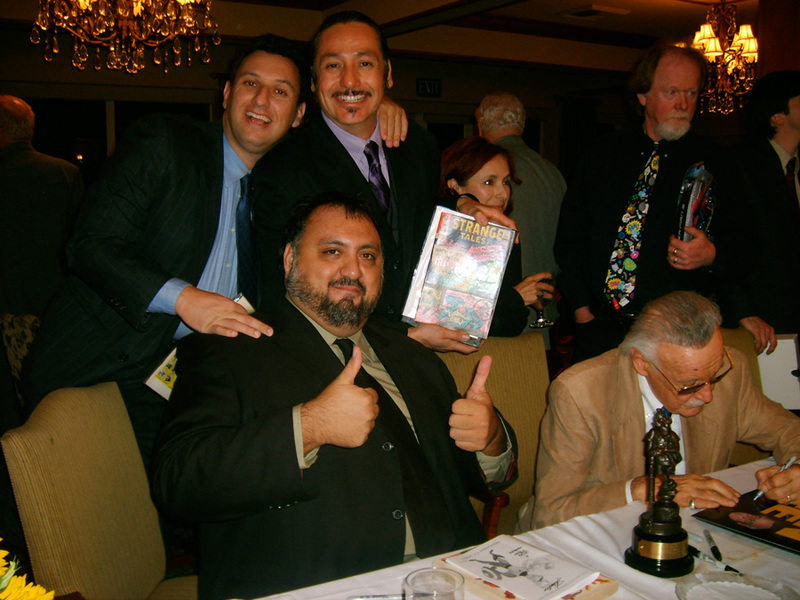 I had met Stan several times over the years at various signings, but to meet him now that I was publishing my own comics, and at an industry banquet, was too good an opportunity to pass up. I had asked Michael if it would be okay if I brought along a book for Stan to sign. Michael was very honest and told me that I could, but suggested we play it by ear if we brought in our books to the building, as this was an industry banquet with a lot of professional cartoonists and bothering the guest of honor for an autograph might be inappropriate. 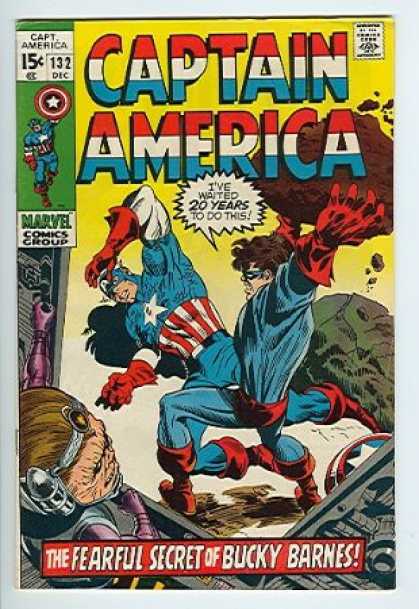 Well, I brought along my well-worn copy of ORIGINS OF MARVEL COMICS, hoping I would have a chance to get it signed. When we got to the lobby of the facility, I noticed a cluster of 'professional cartoonists' huddled around the guest of honor, taking photographs with him and getting his autograph! I figured 'to heck with etiquette' and pulled out my book to get signed as well! Eventually they had Stan sit down, so everyone formed a long line behind the table as Stan freely chatted with every autograph-seeking pro. Standing in line in front of me was veteran, award-winning cartoonist Stan Sakai (USAGI YOJIMBO) and his daughter, getting some Spider-Man action figures autographed. Stan Sakai and daughter getting a signature, and behind them I prepare to get my lucky Sharpie ready for Stan's magic. To my right is bon vivant/cartoonist Michael Aushenker, and to his right is our pal and fellow DIY comic creator, Rafael Navarro. 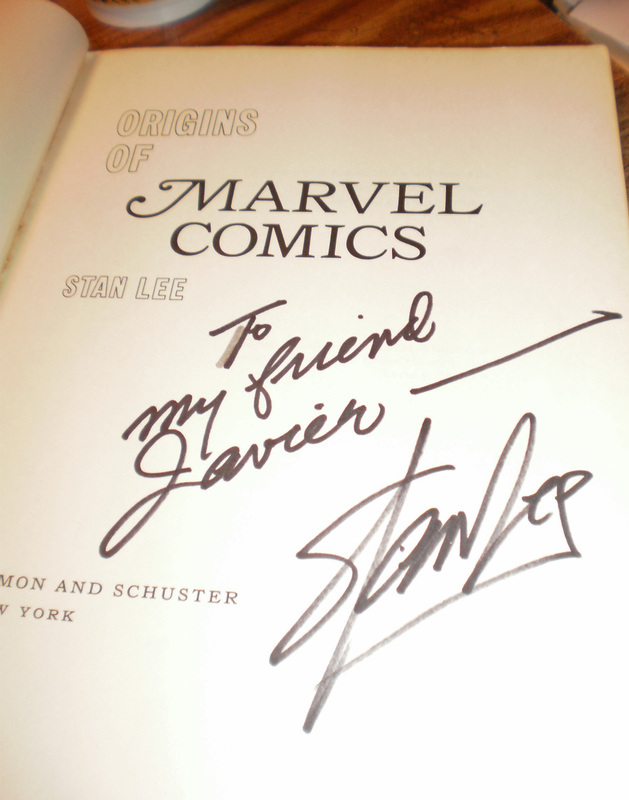 When it was my turn to sit and visit with Stan, I told him "Stan, I've been carrying around this copy of ORIGINS OF MARVEL COMICS for over 30 years. I think I deserve an autograph!". He didn't miss a beat, saying "Oh yeah, sure. Let's have it!" Score!! Three cartooning True Believers victorious once more! ORIGINS OF MARVEL COMICS showed me how heroes were created, and also how heroes of mine created those characters. Some of that insight inspired me later on when I wanted to come up with my own characters. Whatever I paid for that book in the late 70s was money well spent! Next time I'll talk about another book written by Stan that also opened my eyes to the world of creating comics, HOW TO DRAW COMICS THE MARVEL WAY. Stan Lee. 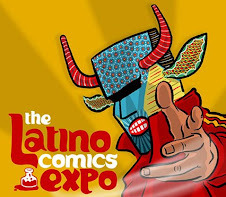 Comic book writer, editor and publisher. Co-creator of some of the most popular and famous super-heroes of all time: Spider-Man, The Fantastic Four, The Hulk, Daredevil, Iron Man, Thor, The X-men, The Avengers and on and on. Stan Lee turns 88 next Tuesday the 28th, and for the next week here on my blog I'll be posting several stories about Stan the Man, particularly how how much of an influence he had on me as a kid, and how that affected me as an artist and publisher. I started reading comics at about age 8, having been given a box of Marvel and DC Comics from my older brother Albert. This would have been around 1974 or '75. My brother had collected comics for a couple of years (1969-71), and one day gave me his stash, as he slowly moved away from collecting them. What was in that box were comics featuring Batman and Superman, but the ones that really struck me were the Marvel Comics, most of them written by a man called Stan Lee, working with such artists as Jack Kirby, John Romita Sr, John Buscema, Gene Colan and others. The sheer excitement of the stories, with such an array of colorful superheroes, had me hooked right from the start. The distinctive look each artist brought to the books was captivating, and with their credits displayed at the beginning of each story (a policy initiated by Stan Lee), I was able to quickly identify each artist and their unique style. But it was Stan's name that tied all these books together, he was the writer on the majority of titles I was given. Roy Thomas had written some of the books in that collection as well, but Stan's name was associated with the greatest number of books I read. 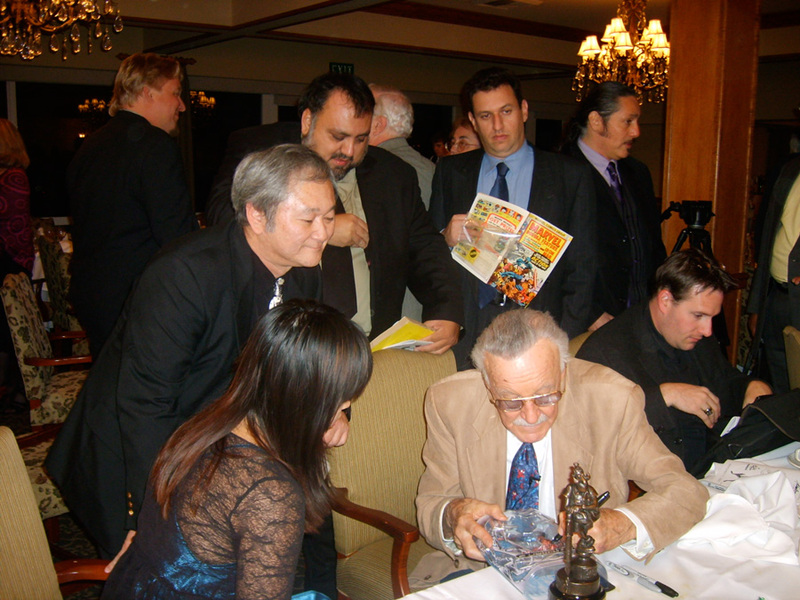 Besides writing exciting stories to go along with the fantastic art, I also enjoyed the editorial side of Stan, the give-and-take with the fans in the letter pages, and also his monthly column, STAN'S SOAPBOX, in which he would frantically tell the readers all the latest news in the world of Marvel. It was Stan's voice that permeated the whole line of Marvel Comics, even when he wasn't the writer of the story. As a young kid, I was totally enthralled with the world of Marvel. The most exciting and dynamic characters, told in colorful adventures by Stan the Man and his team of collaborators. By the time I started buying my own comics off the spinner racks in the mid-70s, Stan wasn't actually writing any of the stories, but was now the publisher and still had a hand in running the show. His STAN'S SOAPBOX column continued every month, and each comic started out with a 'Stan Lee presents:" along the top of the first page. 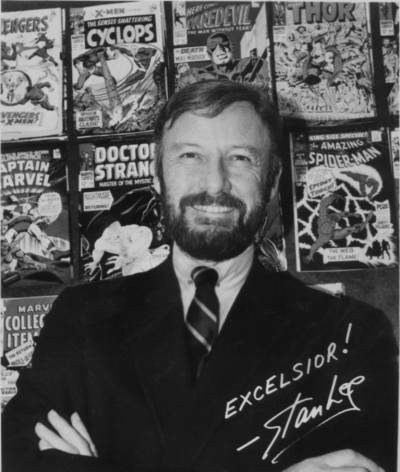 In the 80s Stan moved from New York to California, helping to launch Marvel's move into live-action television and cartoons. Stan, the constant cheerleader for all things Marvel, would occasionally appear in the cartoons as a narrator or in an introduction. 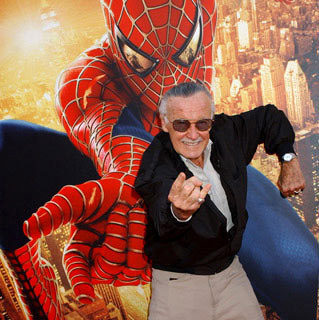 Even today, Stan appears in most of the Marvel movies in cameo roles, showing up right alongside some of the many characters he co-created years ago. It's amazing to me when I think about the presence he's had in my life for the last 35 years or so. Decade after decade, Stan's always there, talking about Marvel and his latest projects. While his main creative legacy, at least the things that I really responded to, occurred before I started buying comics off the racks, I've always followed along with his current endeavors, enjoying them to varying degrees. In the next post, I'll share with you one of the recent times I met Stan the Man, and talk about how his method of creating comics has left a definite impact on my own creative process. THE ART OF OSAMU TEZUKA: GOD OF MANGA is a 272 hardcover book covering the prolific career of Japan's most influential and prolific comic (manga) creator. The book was published last year but I finally got around to getting my own copy last month. First of all, this is a very resourceful book. Only a small percentage of Tezuka's work is available in English, so this book really provides a lot of valuable insight into his many creations that otherwise I may never be able to read in the original Japanese comics. Tezuka passed away in 1989, leaving behind a legacy of innovation in manga and animation. Among his best known works are JUNGLE EMPORER LEO, released in animated form here in the States as KIMBA THE WHITE LION (which Disney pirated from liberally for their LION KING), MIGHTY ATOM (known as ASTROBOY to millions of oversees audiences), BUDDHA and BLACK JACK. BLACK JACK is my favorite work of Tezuka's, featuring a brilliant unlicensed surgeon who performs his miraculous feats of medical miracles for anyone who can afford him. 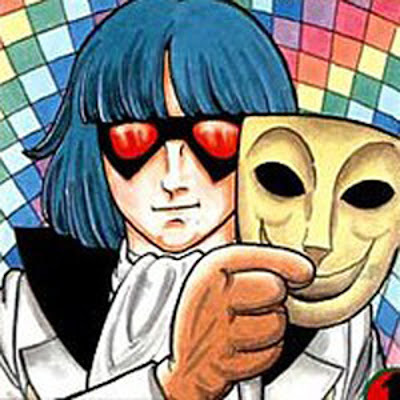 Black Jack himself is a survivor of surgery, having had his body put back together after an explosion in his young childhood left him near death, and his mother dead. The medical dramas Black Jack confronts are usually bizarre cases, like one where a young woman has a giant growth on her body, which turns out to be the living organs of a twin sister which never fully developed. 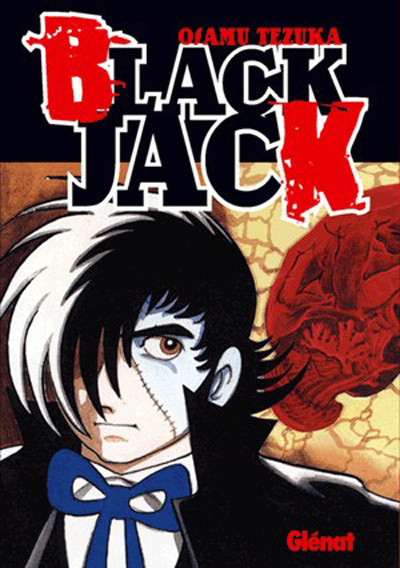 Black Jack actually removes the organs and transplants them into a doll body, giving life to the unborn sister! These stories are truly imaginative, and Tezuka uses the series to explores all matters of life and death, philosophies of existence, in this career spanning series. 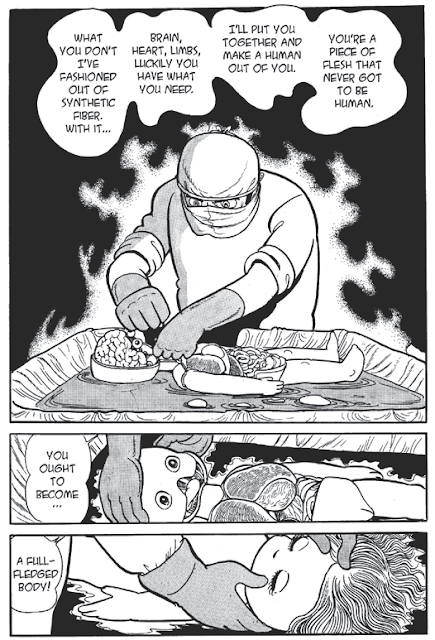 Tezuka himself actually had a medical degree, but decided to continue his early foray into manga as a full-time profession. Not only did he create a lot of innovations in manga, but he was also an early and prolific pioneer in the Japanese animation industry. He even dabbled with acting from time to time. How many cartoonists can you name that are often referred to as 'Doctor' by their assistants? 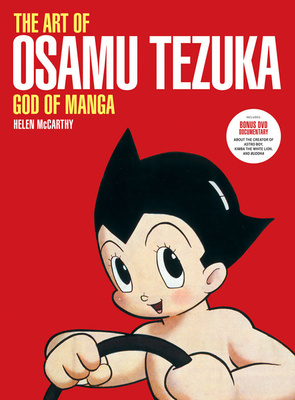 ART OF TEZUKA covers Osamu's life, his early childhood years and family life, as well as chronicling his earliest influences and artistic outputs. What I found invaluable was the decade by decade overview of many of his works, featuring images and a brief synopsis of the stories. Rainbow Parakeet, an actor skilled at mimicry and disguises, who doubles as a master thief. Interestingly, the thing that probably struck me the most was the DVD that comes included with the book. It's a late 1980s television program covering several days in the life of Tezuka. We're given an unprecedented look into his private room in his studio, where no one but his wife is allowed into. His assistants will stand in the doorway to deliver messages or meals, but no one is allowed to enter into his creative space. We also see a moment where Tezuka is rushing to the airport to attend a conference in France, and on the car ride to the airport he's still drawing a page, trying frantically to finish a deadline! The DVD is subtitled in English, and like I mentioned, it's very compelling viewing. To see such a talented artist, and one driven to create such a vast number of works, is an inspiring experience. I can see why he's the only Japanese artist to be called 'god of manga'. If you're interested in any of Tezuka's work, or even if you've never read any of his work but are interested in comics and art, I would wholeheartedly recommend the book. Overall, it's an amazing experience into a fascinating life and career. 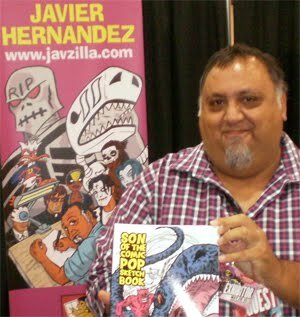 JAVZILLA web shop Holiday Sale ends Sunday!! Thanks to the folks who've purchased stuff from my web shop over the last 2 weeks. I've been running a Holiday Sale with reduced prices on many items, and reduced shipping. 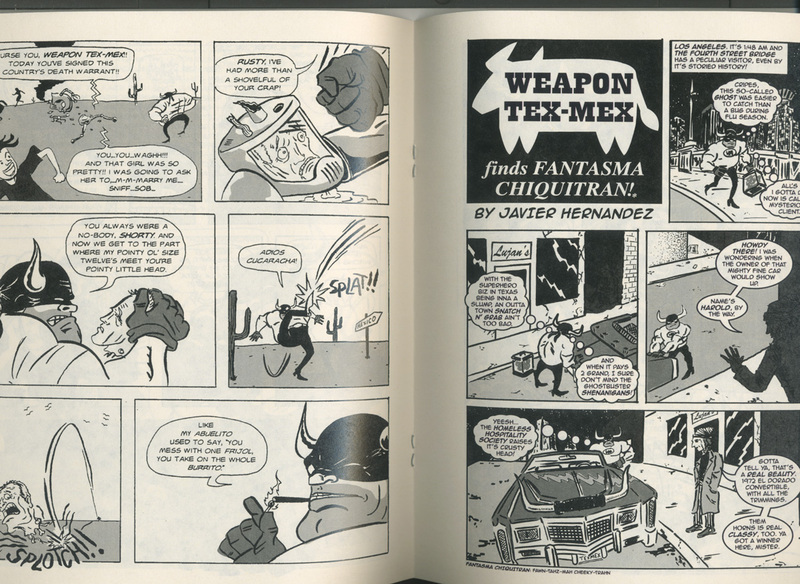 I've even added a previously 'sold out' item, the WANTED: WEAPON TEX-MEX mini-comic that I thought was out-of-stock! With each package I've sent out, I've been including a free extra. There goes the surprise for those that haven't ordered, but maybe that'll give you another reason to plunk down some cyber-bucks and get some stuff! Sergey had ordered some books last year, and put in another order this past week. In an email he said that he was my "#1 fan in Russia". Can't argue with that. Spasibo Bolshoi, Sergey! If you'd like to get my gratitude in your language, please browse the shop and buy the books you'd like. They all come signed, and can be personalized to you or anyone you'd like. I'll ship all orders on Monday, so it's very probable that you'll get them by Friday, Christmas Eve. Click here for the scoop! Last chance to buy!!! WANTED:WEAPON TEX-MEX! I was always skeptical to hear a retailer claim "Warehouse find! Last chance to buy!!" As if they really found a pallet of whatchamacallits hidden off in some corner of the warehouse. Yeah, right!! Well, tell you what folks, there's an old saying: "Don't knock it 'til you try it"!! 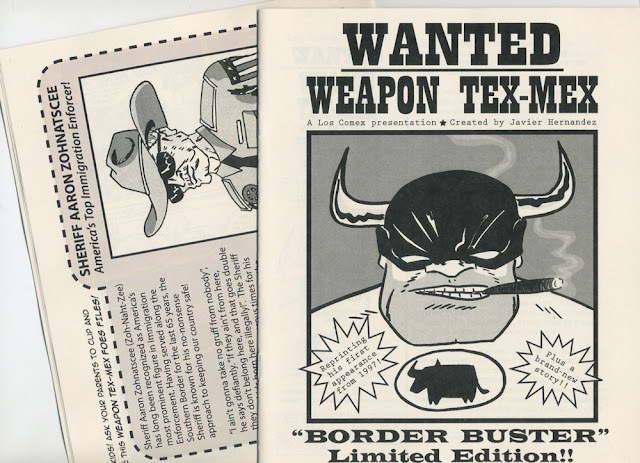 Back in May of this year I blogged that I had a brand-new mini-comic I was debuting at the Phoenix Comic Con, "WANTED: WEAPON TEX-MEX". This featured a reprint of the first Tex-Mex story (from 1997), which was actually my first published work (in Hot Mexican Love Comics). You can actually read that first story here online at the blog, just click up on the tab above. The mini also featured a brand-new Tex-Mex tale, plus a back cover special "Weapon Tex-Mex Foes File". Well, the print run on this mini-comic was only about 40 copies, and I thought I had sold out of them over the last several months. Cover and back cover from "WEAPON: WEAPON TEX-MEX"
Interior center pages from "WANTED:WEAPON TEX-MEX"
So I'm adding them to the Web Shop here on my blog. They were previously listed as 'Sold Out', but they'll be there until they finally sell out for good. While I'm not discounting the price on this book (consider it a special limited edition collectible), you can combine it with other books on sale there until Sunday the 19th. 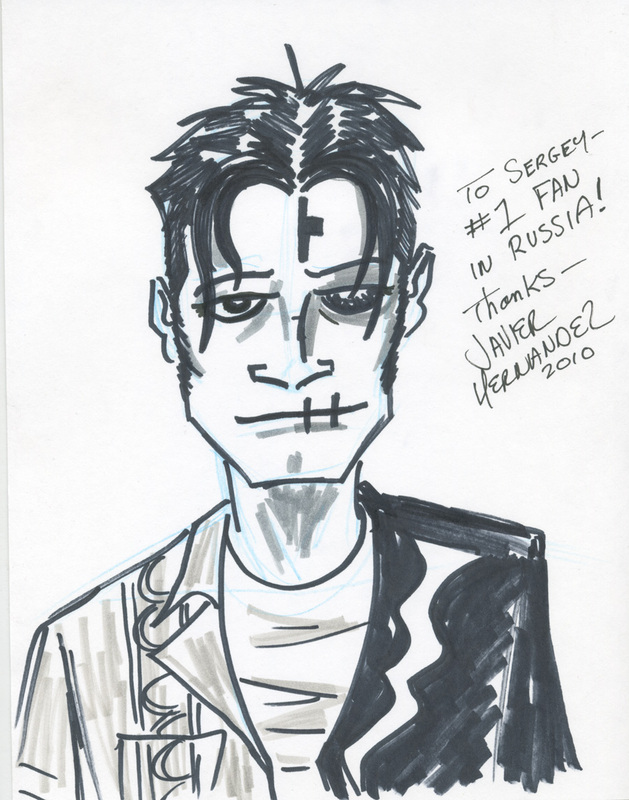 Tex-Mex actually beat El Muerto to print by one year, making him my first officially released comic creation. A much more looser and comedic character than the Aztec Zombie, Tex-Mex really was created as a way of doing bizarro stories with wacky humor and bits of social/cultural/political commentary. A great big lug of a brawler, but with a heart of gold. Kind of like The Thing from Fantastic Four. This past Fall I started teaching a new comic book workshop at Pico Park Community Center. 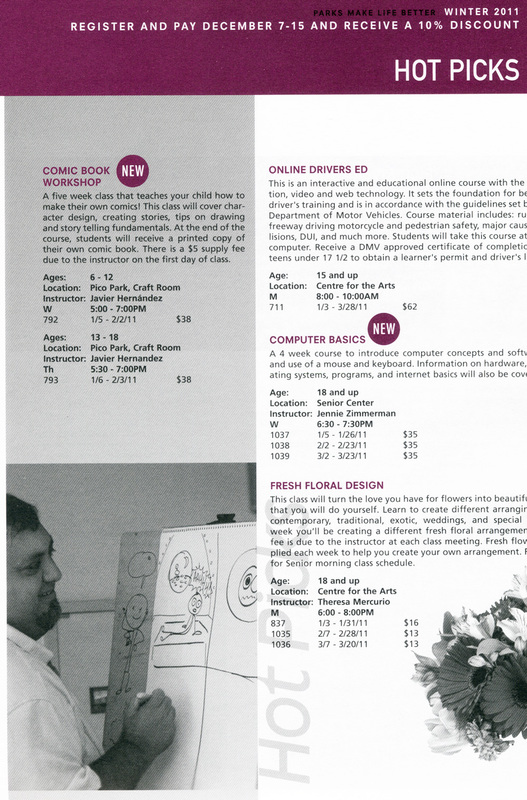 I had previously taught classes at the nearby Pico Rivera Center for the Arts a few years ago, and decided I wanted to approach Pico Park to try out a new batch of classes. 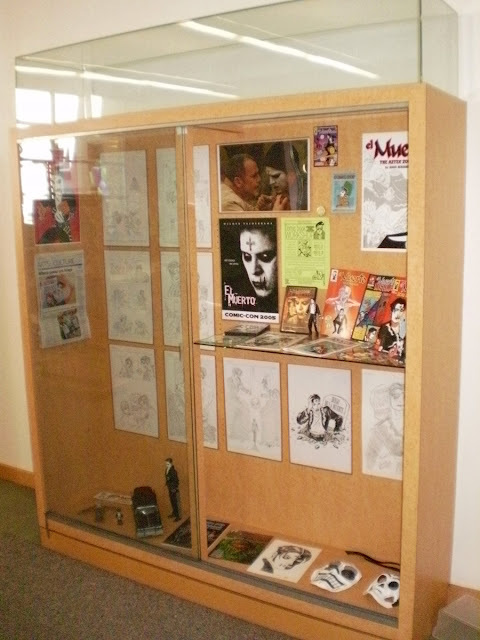 The Park offered me one of the large showcases in the front lobby to make a display that would spotlight my work and help promote the workshop. The turnout for the workshop was great, filling up the roster at 12 kids! Not bad at all for the first comic workshop at that facility. Even more impressive to me than the number of kids was their sheer enthusiasm for making comics. Most of the students were about 9-11 years old, with a few as young as 8. 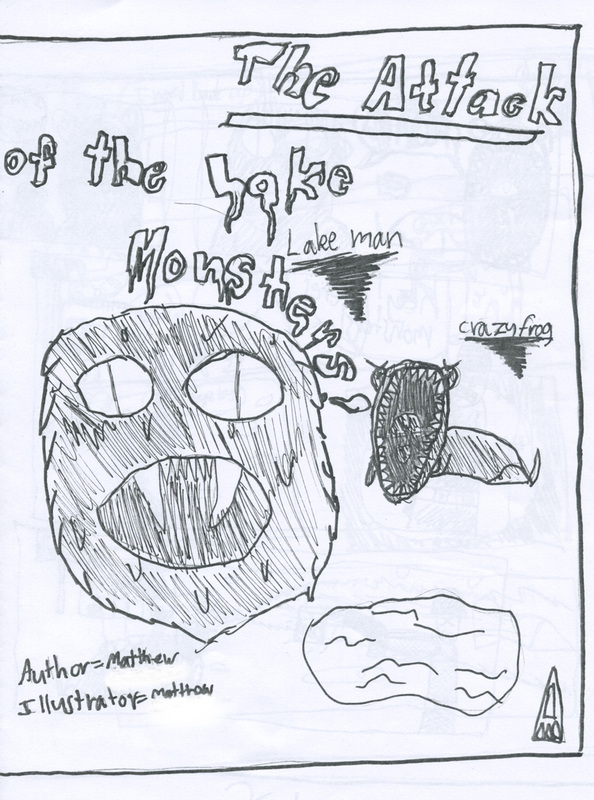 Many of the students had already been creating their own comics, sharing with me some of their previous works. There were a couple that had a really strong sense of storytelling, creating their panels with natural progression from one to another, keeping focused on the thread of the story, and picking some creative shots to compose their panels. 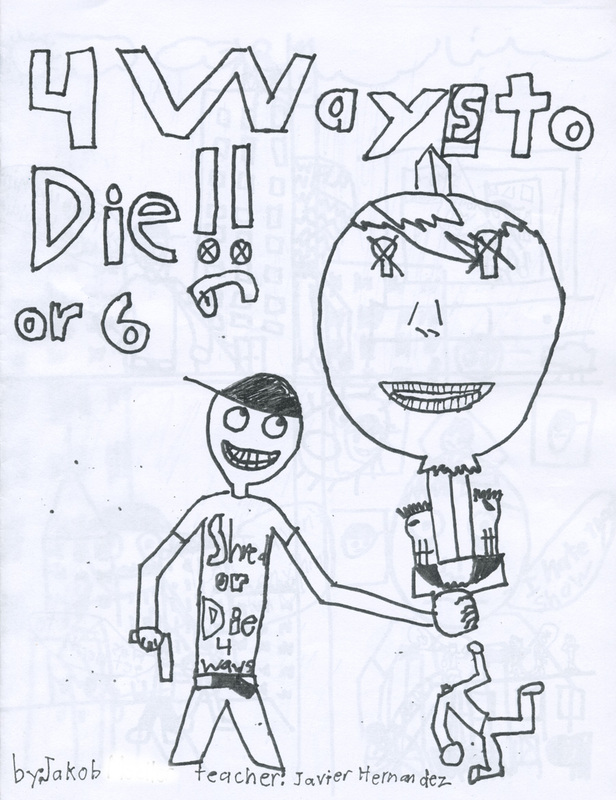 I love the title of Jakob's comic, and the addition of the 'or 6' ! Some of the kids even added my name to their covers, which I totally did not expect. Ivan had asked me if I knew Stan Lee (writer and co-creator of SPIDER-MAN, HULK, X-MEN, THOR etc. ), which kind of amazed me to realize the influence and popularity Stan Lee still has with kids. I was Ivan's age over 30 years ago and I was a total fanatic for Stan! 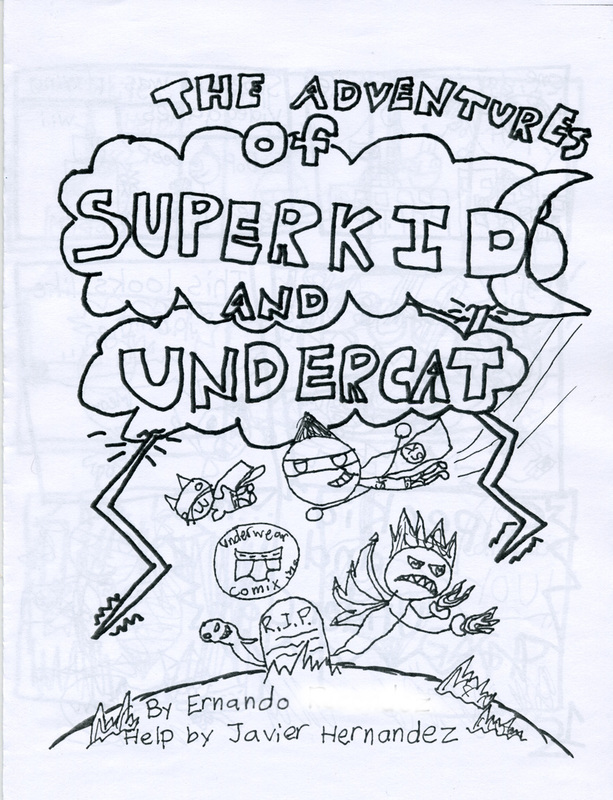 I told Ernando that I thought he was a really imaginative artist and very skilled at making his own comics. What was great was that all the other kids agreed. Matthew has a strong sense of humor with his work, and even makes his own cartoons on his PSP (which I had no idea existed until he first showed me the one he owned!). One thing I always try to make sure I offer in my workshops is to give the students a quick overview of storytelling (breaking down their stories into a 4 page comic, keeping the story flowing from panel to panel, etc) with an interactive demonstration. Also, I always want to make sure I give them photocopied versions of their stories. I know it means more to the student to be able to have some actual copies of their stories in their hands, something they can share with their families and friends. 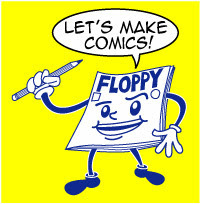 Years ago, when I was a kid, I attended a local 'comic book workshop', expecting to learn about making comics. Well, not only did the instructor not offer any proof of what comics he made, but all he did was sit at the front of the class and told us to draw for a couple of hours! Luckily I had brought a comic book from home, and ended up drawing a picture of Avengers villain Orka!! Even then, I felt that this man (who I could not find a credit for in any of my comics back home) was not a good teacher. I always promised myself that if I ever taught a class in comics, I would make sure I provided some decent instruction, and even give the kids copies of their books. In the past, most of the kids I have taught have been around 13 years old. 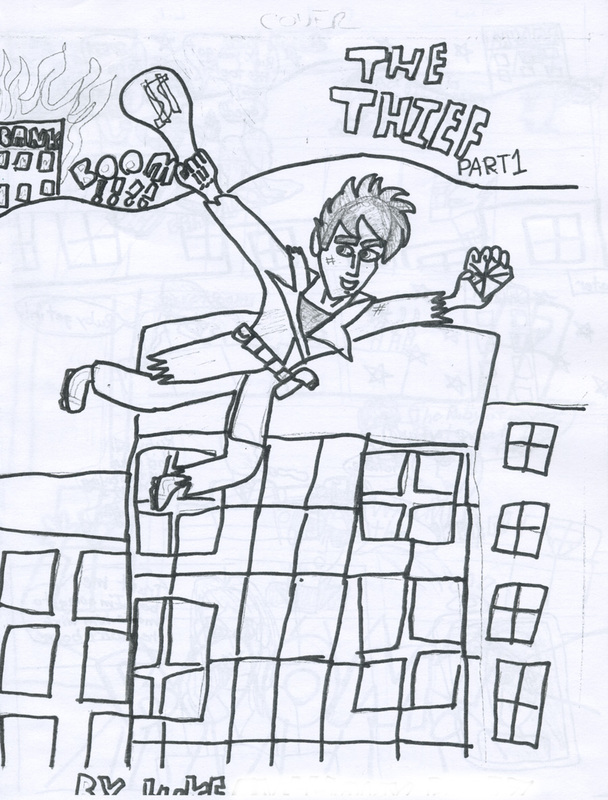 But this group, even at their younger ages, had a pretty good sense of composing their stories with creative choices in their layouts and compositions. It's really inspiring to see their skill levels at this comics creating thing that I love doing. Most already had characters they had created previously, and for the most part they would just proceed to craft their stories. 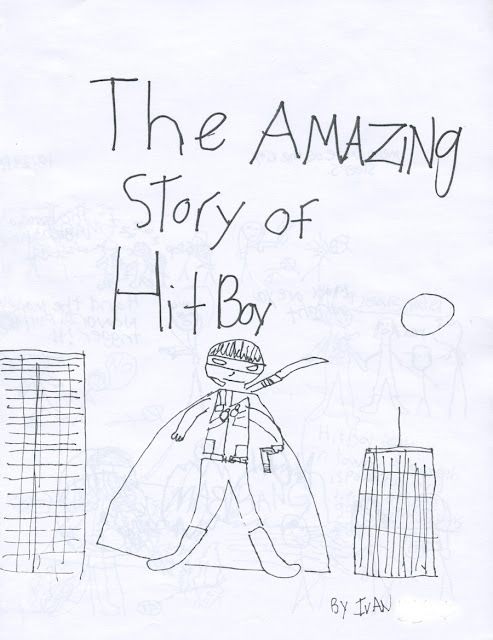 I can see a few of these kids making comics professionally, or working in storyboarding or video games. For me, the class provided a wealth of experience, mostly being exposed to a lot of creative artists. 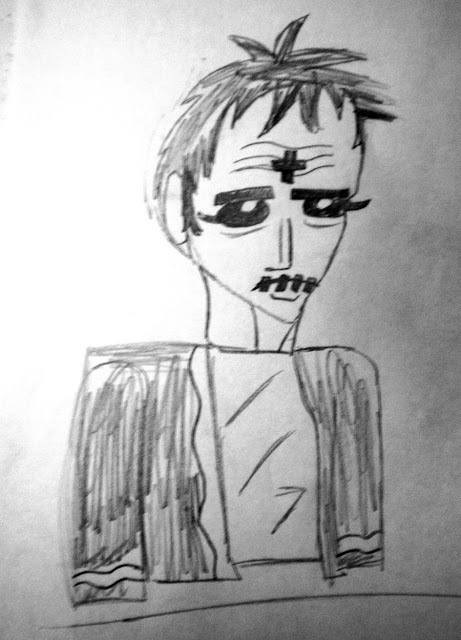 As a treat for the last session of class, I showed them the first 35 minutes or so of my film EL MUERTO (just enough to make sure they saw my cameo, it turns out!). One of the mothers was kind enough to bring in homemade cupcakes and juice for the kids. It was really cool to see some of the kids carry on conversations between themselves about GODZILLA movies or the very specific poses the characters from DRAGONBALL Z would do to activate some of their powers. They reminded me of some of the similar conversations me and my friends have! One of the older kids (who goes by the nom de plume of "JB Comic"!) had looked me up online and started asking me about of the events I had done or comics I had created. I had some minor celebrity status going on in that class! I'm glad to know that I was able to provide these kids with a pretty exciting experience overall, with an introductory instruction on creating comics, but also with a little time for fun. An impromptu EL MUERTO drawing from Luke. Such a distinctive piece. My next classes start in January. Class fee is $38, with a $5 supply fee paid directly to me. They're offering a %10 discount if you register by December 15. All classes are 5 week sessions. Ages 6-12: Class is on Wed., from 5-7 pm, Jan 5 - Feb 2. Ages 13-18: Class is on Thurs., 5:30-7:30pm, Jan 6 - Feb 3. Pico Park, 9528 Beverly Boulevard, Pico Rivera, CA. Look Mom, I'm a HOT PICK!!! Holiday sale in the JAVZILLA Web Shop!